We’ve officially wrapped up the second round of community engagement, which included in-person Community Visioning Workshops held throughout the Great Parks of Hamilton County in May and an online workshop. Click here to read more about the in-person workshops. From the feedback received at the fall workshops that were held in 2017, which you can read about here, the planning team developed draft recommendations. The purpose of these spring workshops was to gather community feedback of the draft recommendations for the plan. Survey participants agree that conservation should remain a priority for Great Parks and that education is key to getting people engaged in conservation efforts. Park users are excited about the opportunity to create water trails and increase water access throughout the county. 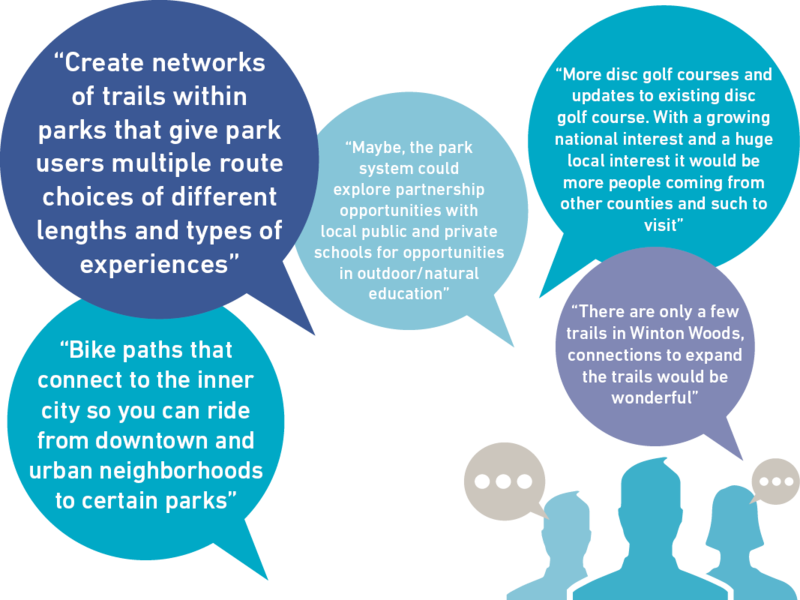 People feel strongly that the existing disc golf courses need to be improved and some mentioned that Great Parks should consider increasing the number of courses. Survey respondents want to see Great Parks partner with more community organizations, local and regional jurisdictions, and other like-minded entities. For the next few months, the planning team will be refining their recommendations based on the feedback from the second round of workshops and creating a draft plan document. Click here to sign-up for the e-newsletter to stay in-the-know on the planning process.